Choosing a field of art that was thought as obsolete and abandoned at one point, adopting it, adding your own style – it can result in magnificent pieces, unique and easily recognizable. 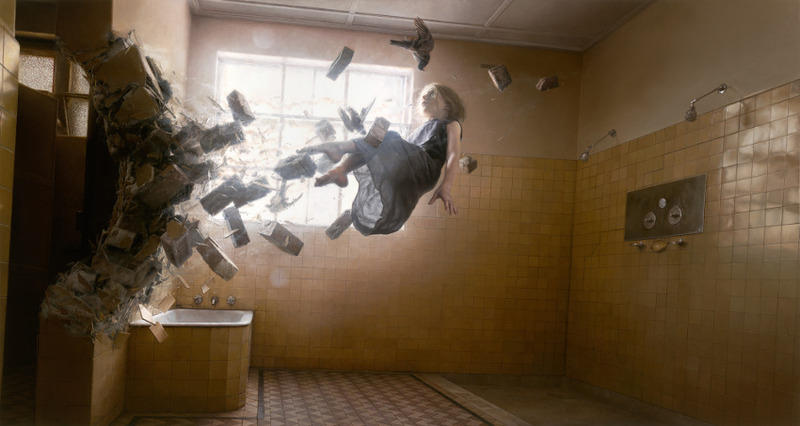 Jeremy Geddes is an Australian painter who’s embraced the ideas of realism, melding it to his personal benefit. The fact that no one taught about realism at college he attended didn’t discourage him. It rather solidified his decision and need to be a realist. There is a tendency of categorizing his work as photorealism or even hyper-realism, but he’s not very interested in the semi-formal list of style goals and delineations usually attached to any major artistic style. He rather does his own thing, without paying much attention to the movements around him. As the artist admits, he fails to see the difference between photorealism and hyperrealism. He thinks that photorealists are producing flat paintings, with the brush marks being blended away and hiding the physical nature of the medium. The greater part of his interest in painting is based right there, in using the abstract marks made by a brush in order to describe forms. Happening on a small scale and not apparent when the work is shrunk for the web or print, it still keeps Geddes excited about painting. Speaking on a more technical level, he’s much more drawn to the Pre-Raphaelites and the Victorian Academic painters. He’s inspired by Leon Bonnat and Jean-Leon Gerome, Antonio Garcia Lopez – a modern realist painter, and even Magritte, a master of surrealism. Some of his earliest influences were the painters working in the illustration field, such as Chris Foss and John Harris. Light is one the elements he’s most concerned with, as it has the ability to set the tone and general mood, and is used as a sort of visual glue tasked with holding all the bits and pieces together. Striving to achieve cohesion, Geddes never paints light per se, but rather tries to depict the behavior of light on forms and surfaces. He’s playing with the elements in the work, manipulating them and pushing their intersection with light to achieve an effect, but no venturing too far and keeping the sense of reality intact. The size of the pieces is one more curiosity in Geddes’ work. The details give off an impression that they’re large in size, and yet they’re relatively small. The decision on the size comes down to something mundane as the actions of his wrist, the way he stands at the painting or the way he makes the paint marks. However, being extremely rigorous in preparations, the artist always thinks about how the artwork will be perceived in the flesh, the proximity of the viewers, the level of the abstraction occurring on the level of the individual brush strokes that he actually wants to be seen etc. Choosing the appropriate size is still in flux and the artist intends to experiment with it. Although there are some recurring motifs in his work, like doves and astronauts, the artist avoids attaching a specific narrative to his paintings and rather leaves them open to interpretation. This way allows the individual viewers to make a connection between disparate elements and create a structure that resonates with each of them personally. Different pieces in the Cosmonaut series have red, black, white space, and Geddes says that’s because he thinks of his paintings as if they represent internal mental state, so the different colored background isn’t really an outer space as much it is a part of the emotional state the each painting is striving for. As mentioned above, doves are also a recurring motif. The artist loves them and their ability to thrive in spaces controlled by humans. They can become the focus of the painting, quietly standing as nonhuman life in places dominated by humans, while their appearance seems not unusual. The process takes a lot of time. With each piece comes a significant amount of possibilities about where to go, and the artist makes the final decision by producing a number of small studies of potential pieces. He refines them, adds or subtracts elements, play with tone and composition until something sticks with him personally. In order to avoid the disappointment of a painting that’s a failure, Geddes undergoes an extremely thorough process of preparation, which can last a whole year before he begins working on an actual artwork. It starts with small sketches to rough out initial ideas, which then evolve into small studies. Geddes refuses to make any real decisions about them for about a month or two, escaping the traps of being misled by the initial excitement. He known to well that enthusiasm alone, without solving outstanding issues, can be a recipe for an artistic disaster. The painting itself can last up to three months. Geddes has been drawing from an early age, and he perceives painting as a natural progression. He was born in Wellington, New Zealand, and is currently based in Melbourne, where he studied Painting at the Victorian College of the Art, University of Melbourne, earned a BFA in 1995 and an MFA two years later. Even though he possesses a strong formal education, he considers himself a self-taught artist. As a realist painter, he realized that many of its techniques have been removed from the teaching books in the 60’s, and many of the professors hadn’t really been trained in realism and weren’t quite able to teach about it. This lack of school training in realism didn’t turn out all bad – Geddes spent a lot of time solving problems and approaching issues in different ways, hoping to achieve different results than expected. It was (and still is) a long road, but it resulted in artist’s unique visual language. 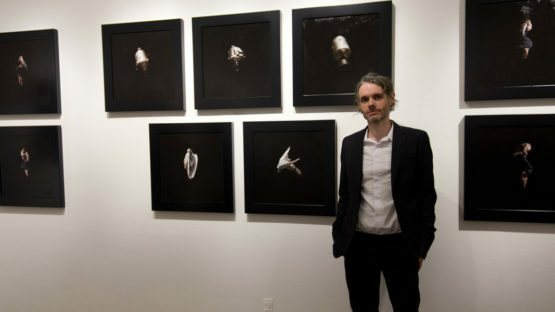 His first solo show was titled Exhale, and was held in 2012 at the Jonathan Levine Gallery in New York, after which he was included in several successful group shows. Music is one of the most important aspects of his work. It provides an opportunity for the artist to identify and refine feelings more easily, and Geddes uses it extensively. If a song or composition triggers just the right emotional note, he can use it as a test. If the sketch or a study resonates with the music, he will pursue it and finish the piece. Just the same, if something feels off, the concept will be dropped. The music choice ranges from ambient and drone, to modern classical. As a sort of thank you, some of his painting are named after the musical pieces that helped in resolving emotional components, like Acedia, named after a Sinke Dûs piece. The names obviously need to have more resonance than just this, but the artist tends to run with it when the painting, music, and the name simply click. The goal behind Geddes’ art is to trigger meditative or emotional states in the observers. At least in some of them. It is very satisfying to see that his work has that exact effect on the people. Painting images that make him respond emotionally, he hopes to find people who have an internal life similar to his own, so they experience the same emotions upon viewing the paintings. The artist is working hastily at the moment, preparing for a solo show at the Jonathan LeVine Gallery in New York. 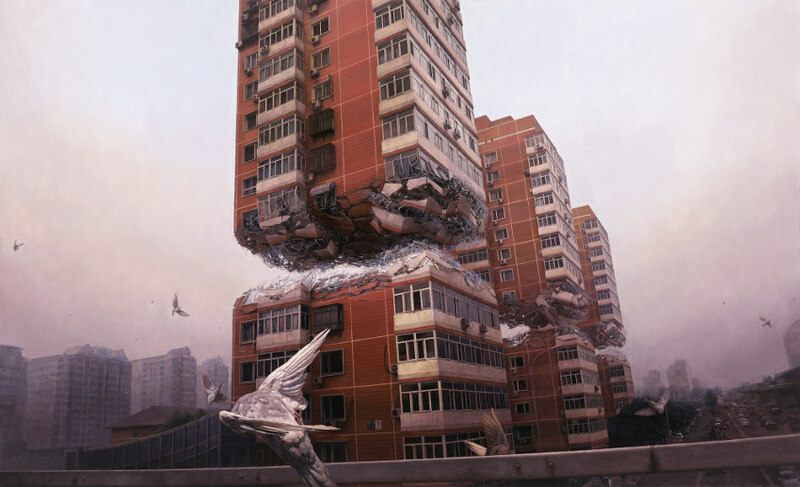 Jeremy Geddes is living and working in Melbourne, Australia.